National Fossil Day is a celebration organized by the National Park Service to promote public awareness and stewardship of fossils, as well as to foster a greater appreciation of their scientific and educational values. For more information visit the National Fossil Day webpage. PARKING | At 5:00pm, the parking lot (Lot B) to the east of the building becomes free parking. DESCRIPTION | Activities include rock and fossil identifications; tours of the Research Collections Room, which only happen once a year; a few short videos on Quetzacoatlus featured in this year’s artwork; and activities geared especially for kids ages 5 to 12 will take place at the Junior Paleontologist Station. TOUR STATIONS | There will be volunteers at each station with information and to answer questions during this “self-guided” event. All stations will be in the C.H. Clapp building (CHCB). For more information on any of these stations visit the Welcome Table on the 1st floor, east atrium. Follow the footprints! *please arrive at least 5 minutes in advance, no admittance once door is closed. Mark your calendars! 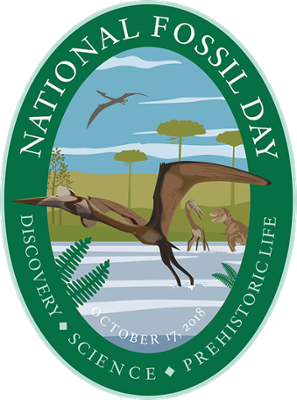 The next National Fossil Day Celebration will be October 16, 2019.